Eight marine mammals rescued by SeaWorld San Diego, including a sea lion found with a fishing line wrapped around its neck, were returned to the ocean Thursday, officials at the theme park said. 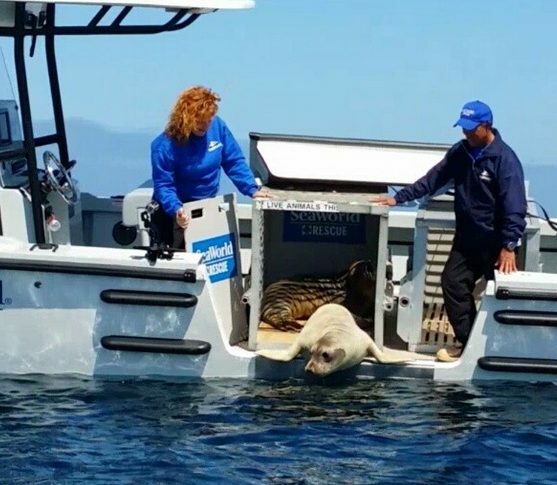 Four sea lions, two harbor seals and two elephant seals were rehabilitated before they were put back in the water. SeaWorld officials captured the occasion on Instagram. All eight were discovered malnourished and dehydrated on local beaches earlier this spring. One of the harbor seals was found with its umbilical cord still attached. SeaWorld officials said when it became clear the mother wasn’t coming back, they took the infant seal back to the park and fed it out of a bottle. More than 175 ill, injured or stranded marine mammals have been rescued so far this year, a number that is above average but fewer than last year, according to SeaWorld. Usually, about 70 percent of rescued marine mammals are able to return to the ocean.